The category five cyclone hit Port Vila, the capital of Vanuatu on the central island of Efate, on Friday evening with winds of 250 km/hr and gusts up to 320 km/hr causing catastrophic destruction. The cyclone then moved south hitting Erromango and Tanna islands with similar catastrophic impact. Other islands in the Pacific have also been impacted by the current storms. Vanuatu has a population of 267,000 people spread over 65 islands. About 47,000 people live in the capital of Port Vila. At least half of the population, or about 130,000 people, has been affected, according to the Vanuatu Red Cross Society. UNICEF estimates that at least 60,000 children across the country could be at risk. Much infrastructure has been damaged: most roads are flooded or blocked by fallen trees, 80% of power lines are estimated to be down in Port Vila, and most telephone, mobile and internet networks are not functioning. Even Vanuatu’s National Disaster Management Office (NDMO) HF radio system has been damaged, meaning that contact with the provinces has been lost. 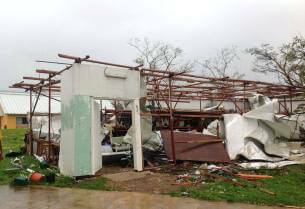 Although badly damaged, the main hospital in Port Vila is operational. The entire country has likely been affected, to some extent, by the extremely damaging winds, heavy rainfall, storm surges and flooding. On Efate, the most populous island, UN OCHA reports an estimated 90 per cent of structures are either damaged or destroyed. Access to the most affected areas of Efate province is blocked as the Teouma bridge has been badly damaged and affected by a flash flood. There is concern for the most southerly islands that were hit by the eye of the storm and are currently without communication. The Anglican Church of Melanesia (ACOM), with two dioceses in Vanuatu, has developed staff skilled in disaster preparedness and response, in collaboration with Anglican agencies. These skills brought both resilience and effectiveness to ACOM’s response to flash flooding in the Solomon Islands last year and will be invaluable as the Church now responds to the current terrible disaster in Vanuatu. Archbishop David Vunagi, Provincial Primate based in the Solomon Islands, has been in touch with the Anglican Alliance to discuss the situation and how we can, as the Anglican family, stand in solidarity at this time through prayer and support. Anglican partners have launched appeals, see below, and will be working with ACOM and using their established Church networks in Vanuatu to respond. Julianne Stewart, programs director of the Anglican Board of Mission (ABM) in Australia, writes: “ABM is working within a coordinated response with other ecumenical partners with whom we’ve worked for the last five years in development programs in Vanuatu under the umbrella of the Church Partnership Program. 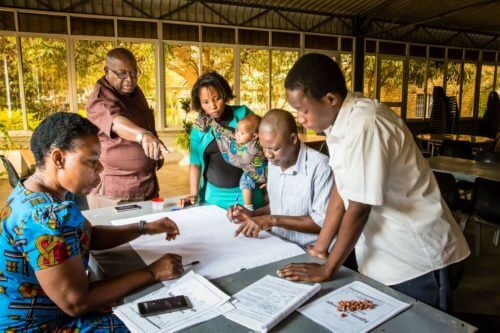 This enables churches and their Australian NGO partners to share expertise and really target the areas of greatest need, and avoid duplications, have economies of scale, share assessments, etc. Julianne commented that Pentecost and Ambae islands are likely to be a focus for response. These are well populated northern islands that were hit by the cyclone as it moved south through Vanuatu. Support ABM’s $100,000 appeal here. Sabene Gomez, Pacific programs manager for Anglican Overseas Aid (AOA) in Australia, says they are trying to get through to the northern islands, and are raising funds to help cope with what they expect to find when they do. “The church really has the networks, so has the reach to the communities,” she said on ABC news today. Support Anglican Oversea’s Aid appeal here. Anglican Missions (AMB) in New Zealand has launched a ‘Cyclone Pam Emergency Appeal’ to assist with relief efforts in the Pacific region, particularly in Vanuatu. They report that while details are still sketchy, it is clear this is one of the worst disasters ever experienced in the South Pacific region. AMB is working with churches and relief agencies to help coordinate relief efforts. The Primate’s Fund for World Relief and Development (Cananda) has already made a significant pledge towards the Vanuatu response, through the ACT Alliance appeal. Support the ACT Alliance appeal here. Christian Aid are also supporting the response through the ACT Alliance. Episcopal Relief & Development have also reached out to the church in Vanuatu, and to the provincial office in Honiara to offer our thoughts and prayers, and they look forward to working in collaboration with other Anglican agencies for a coordinated response. Support Episcopal Relief & Development’s Disaster Response appeal here. Almighty God, in whom we live and move and have our being, cradle in your loving arms the peoples of Vanuatu and their neighbours affected by Cyclone Pam: comfort the bereaved, strengthen the distressed and uphold those reaching out across oceans in support at this time of distress; through Jesus Christ our Lord. Amen. Vanuatu’s motto is ‘In God We Stand’. We pray that in this time of trouble and devastation, the people of Vanuatu would know God’s presence with them. We pray for the Archbishop of Melanesia and Bishop of Central Melanesia, The Most Revd David Vunagi and his wife Mrs. Mary Vunagi, Provincial President of Mothers’ Union, as they make contact with the Bishops in the affected areas, support Mothers’ Union members and consider how to respond to the situation. We also pray for the National Disaster Management Office of the Vanuatu Government who is coordinating the response to this disaster. As the aid effort begins, with limited information and scarcity of resource, we pray Lord that you would help relief workers to have wisdom and clarity in assessing need. As communications are coming back online we pray that the people of Vanuatu will be able to communicate their need and that it may be met. We pray for all those waiting to hear if their families are safe. We pray for comfort for all those who have lost loved ones and their homes in this time of distress. May they know the gentle touch of God at this time and in the coming days. More information prayers and information can be found here. Other Anglican and Episcopal agencies will likely follow up with their own appeals in coming days. These will be added to this website article. Save the Children and Oxfam have also launched emergency appeals. The Anglican Alliance will continue to connect closely with the Anglican Church of Melanesia and its two dioceses in Vanuatu – and will share this information and prayer requests with ACOM’s partners around the Communion, through media and conference calls. Photo: A home devastated by Cyclone Pam in Vanuatu.